2016 is definitely the year of the awakening of XMPP. It is already mid-year, but here is what happened already, and what we can do next. At the FOSDEM 2016 and XMPP Summit 19, Matthew Wild, lead developer of Prosody, pushed the XMPP community into « Exploring the non-technical requirements of open communication« , which lead to the creation of a very small website (although unmaintained), but still a very strong initiative: modernxmpp.org. As an XSF Council member, Matthew opened up minds with this thinking out of the box. I did my part, by contributing to the wake up call, with « The state of XMPP and instant messaging, The awakening« , followed by « Welcome to the third generation of Instant Messaging! » part 1 (1st and 2nd gen of IM) and part 2 (3rd gen of IM, synthesis matrix), and « 3 gens of IM, next steps for XMPP« . I believe this had its positive effects as well, as some items were actively discussed forward at the XMPP Summit 20 (hosted by Atlassian, makers of the 3rd gen IM HipChat, based on XMPP), and the feedback from the nice guys of Tigase said: « The most prevalent topic at the summit was the future of XMPP communication, and how it can fit into the third generation of instant messaging. ». Daniel Gultsch, lead developer of Conversations.im Android client, has written a thought-provoking piece on « The State of Mobile XMPP in 2016« , pointing at strengths and weaknesses, and debunking some misunderstanding. Today, it is Georg Lukas, pointing out « Easy XMPP« , with « Easy Onboarding » and « Easy Roster Invitations« . To quote Georg, « After reflecting upon all these things though I must say that I am surprised how much low-hanging fruit we’ve ignored over the last decade or so ». Is it time we start to write a vision statement and a roadmap for the next 6 to 12 months? After the XMPP Summit and the FOSDEM in Brussels this week-end (on Thu 28 + Fri 29 and Sat 30 + Sun 31), I can now expose and share my feelings. Having been an XMPP evangelist for many years, at some point I simply lacked motivation and belief. Since I was hired at Erlang Solutions as a Product Owner for the MongooseIM XMPP server, I met a highly competent and clever team. I was wondering since, if I should wear again my promoter hat. Now I know. At the XMPP Summit, a lot of discussions took place, and we definitely say we have moved one strong step forward (MIX, E2E, simpler reconnection). It has been a highly productive edition, with applied core values, such as openness, ownership and responsibility. I believe we have here the basis of renewal, with some initiatives that need to include a larger crowd for more feedback, in order to build a real vision. Can you please participate in this little poll? This Thursday 28th and Friday 29th of January 2016, it is the 19th XMPP Summit, that will be held in Brussels, and I will be there Erlang Solutions, especially with Michal Piotrowski, the tech lead of MongooseIM. 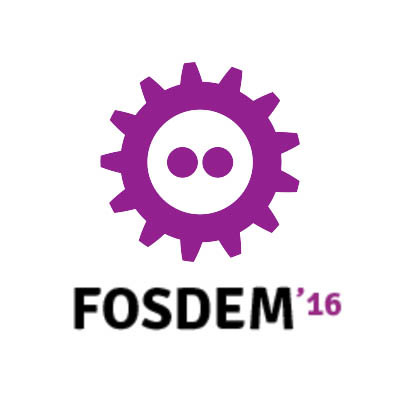 This Saturday 30th and Sunday 31st, it is the FOSDEM. I will give a talk, in the Real-Time devroom: « The state of XMPP and instant messaging, The awakening« . Ce jeudi 28 et ce vendredi 29 janvier 2016, c’est le 19e sommet XMPP, qui se tiendra à Bruxelles, et j’y serai avec Erlang Solutions, notamment Michal Piotrowski, le tech lead de MongooseIM. Ce samedi 30 et dimanche 31, c’est le FOSDEM. J’y donnerai une conférence, dans la devroom Real-Time: « The state of XMPP and instant messaging, The awakening ». Exciting XMPP news of the world! Lots of news this week! VideoMost uses XMPP for signalling. The node-xmpp project has released node-xmpp-core 5.0.
xmppbot is a client for the Laravel PHP framework. livecoding.tv has explained in a blog post how to live chat on top of coding streams. The french-speaking Firefox OS community has released an interesting and insightful article (in french, sorry) about the Instant Messaging apps in Firefox OS. Do you want to read it in automated, approximately translated version? Check out the blog post for all the infos: MongooseIM 1.6: Riak, DevOps love, and so much more! voipcenter.be has released version 6.0.10 of the cloud PBX, with XMPP integration, for presence and signalling. Do you want to help XMPP? Want a decentralized, encrypted, Free (as in freedom) “social” app on Android and desktop ? Crownfunding XMPP: https://t.co/R9F7G3i5nL please help them! We have just launched a crowdfunding campaign to develop a new frontend to Libervia, and port it to Android (in a native application!). You can go to the crowdfunding platform, and give money to: Libervia- Ethical and Free (Libre) social network. Here are the new news of XMPP! The habahaba.im online service is described in the wiki: features, sceenshots, and video. The source code is available: https://github.com/jbinary/habahaba-js. Thanks to Sergey Dobrov! Did you know that xmpp:bot@im.wordpress.com notifies you via XMPP of all the comments on your WordPress.com blog? A simple Django notification bot. DreamHost October Newslettery: What’s That Feature? The WTF of DreamHost: « What’s that feature? It’s XMPP!« . This points to their wiki. Fastmail closes their XMPP server on the 31st of January 2016. Sad. Daniel Pocock tries to reproduce the Debian experience, but this time at Fedora. Do you like these news?